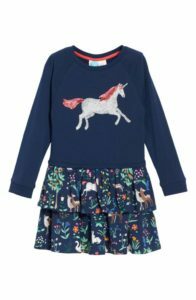 Unicorn Twirly Sequin Dress – Let’s face it, Boden won fall. With the addition of unicorns and dragons to their classic woodland designs, Noelle’s closet has become a shrine to Johnnie. I’m not complaining. 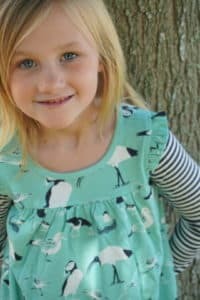 It was hard to pick a favorite, but this dress is super soft and combines a cute fit with something that will win any 6 year old over, sequins… We plan to pair it with cable footless tights (in soft blossom pink), but there are a ton of colors in the print, so you have options. Boden is currently offering 25% off through Thursday (10/26) with promo code 7V2T – many styles are backordering and selling out, so I would definitely grab your must-haves. You can check out the Unicorn Dress here! Tucker + Tate Sadie Jeggings – Yup. My #2 item for Noelle are these jeggings from Tucker + Tate. They are incredibly soft (she’s not a fan of true denim) and feel more like a very thick legging than a pair of jeans. We already have 3 pairs and I will be grabbing the next size up as soon as they hit the sale rack! They look great with everything (she’s wearing them with a Peek Glow in the Dark Tee). Grab a pair for your daughter here! 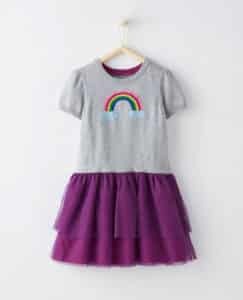 Hanna Andersson Rainbow Sweater Dress – Rainbows and Tulle? Need I say more? I do have to say that I was a bit put off by a short sleeved sweater dress for our Connecticut winter, BUT I bought it anyways and LOVE it on her! The knit is super soft. I plan to pair it with their grey bright basics footless tights, but also grabbed this cute pair of polka dot (the jury is still out on whether or not footed tights are acceptable this year). We have bought a TON of Hanna Andersson this year – the quality is amazing and their designs are adorable! 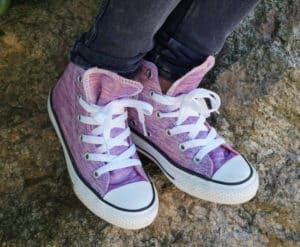 Converse Jersey Knit Sneakers – there is so much purple this fall, that these.match.everything! I also bought a blue low top that has been a nice match for many of the Tea Collection separates. These were a retail purchase for me – SUPER RARE and totally worth it! They are marked down a bit now, you can grab them in toddler through little kids sizes here. Honorable Mention: Peek Science Tees! 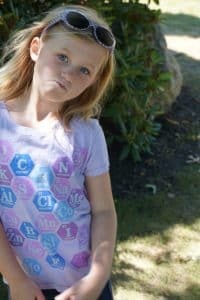 I can’t close this out without mentioning Peek’s Science Tees for girls. The Element Tee is one of my FAVORITE tees of all time, but it sadly sold out in most of the bigger sizes. Peek does still have a number of other cute science tees and they are all marked down here! 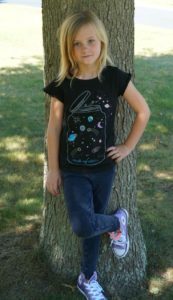 That was a quick round up of our fall fashion picks for girls! Below is a sampling of some of our other favorite pieces from the brands above! Keep an eye out for Fall Clearance sales ahead! Join our Facebook Group to follow sales and promos! Next Post Get Festive with Matching Family Holiday Pajamas!